Compressco Warehouse, formerly Globe Industrial Warehouse, was built in 1969 on a 15-acre site in Kilgore, Texas. 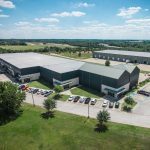 Structures include a 4,225 SF office, a 5,625 SF three-bay shop, a 2,250 SF wash bay, and two 135′ x 20′ aprons in the shop section. There is a 6-foot water well on the site as well. Sign up here to receive news about Napali Capital, Investment tips, Investment Opportunities, Podcasts, Property Updates, and more!